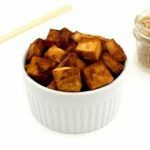 An easy recipe for Tofu that can be eaten by itself or added to stir-frys, salads, soups or sandwiches. Tofu must be compressed to eliminate as much water as possible. Place tofu in a shallow bowl, place a small plate on top and a heavy can on top of the plate, over night in the refrigerator. Discard the water. Cut the tofu into small cubes, about 1 inch square. For the marinade, put the remaining ingredients in a baking dish and blend well. Put the tofu cubes into the baking dish/marinade and place in a preheated 375 degree oven. Bake about 35-45 minutes or until all the liquid is absorbed. Use as side dish or any way you wish.